I would hit myself over the head multiple times if I didn't post on Leap Day! After all, this is day that happens only once every five years! A grand day where 48 year-old men celebrate their 12th birthdays. A day where contracts of piracy are not met, and are therefore still valid. A day where Leap Day William emerges out of Mariana Trench to trade children's tears for candy. A day where you have to wear yellow and blue or be at risk of being poked in the eye and having your hair pulled. A day where you can do anything and everything you want because real life is for March! A day that had no real tradition until I watched 30 Rock's episode on Leap Day. Here's a clip. Bahaha! So good. So good, indeed. If you have 25 minutes, I highly suggest you watch the episode in its entirety via this link here. My Leap Day was rather uneventful, but I have a good four years to get these fun traditions talked up before the next Leap Day. One of my readers wanted me to post a photo of what I wore today, but I'm already in my pajamas and I don't want to change. So here's a nice picture of me drawn in paint. 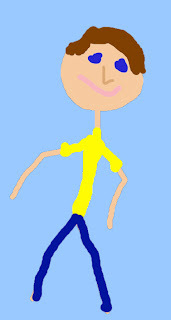 I wore a bright yellow short-sleeve shirt and blue Levi's. Woot. Does anyone legitimately celebrate Leap Day? If you do, how do you celebrate? This good brother is Charlie M. He was 84 years of age when this photo was taken. We were knocking doors, he let us in and showed us how he keeps busy during retirement: making patchwork quilts out of random fabric pieces he gets at thrift shops. He was a very nice man. Senile, but nice. Hahahaah. I never knew about blue and yellow weird. So are you saying my anniversary isn't real life? Hum. Loaded statement. Walking away yelling "I've NEVER met him before officer!!"